-escape velocity of 218 to 358 kph. The huge variance in gravity of course is due to the odd shape, and the higher gravity is found near the centre whereas the lower is what one finds at the very tip. 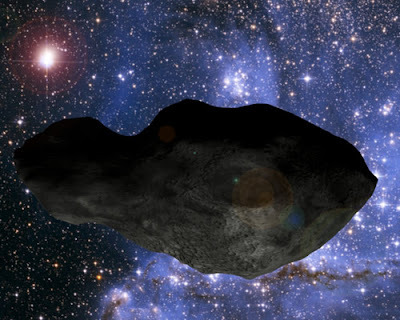 Nevertheless, an escape velocity of 218 kph even at the tip means that this is no Little Prince-style asteroid that one can fall off of at any moment, and even its thinnest part has a diameter equal to the distance from Washington to Baltimore, or Berlin to the Polish border. Its two moons are 3 km and 5 km in diameter, so fairly hefty as well for asteroid satellites. Orbit is also standard for an object in the asteroid belt, between Mars and Jupiter and with a certain amount of inclination but not so much as to make sending a probe there overly difficult. 216 Kleopatra is the kind of target that Japan's space program seems to like. The Japanese probe Hayabusa is arriving at Earth today (finally!) and a mission to 216 Kleopatra would be about the same level of difficulty. Considering the presence of its two moons, an ideal mission might be a main probe accompanied by two smaller and less sophisticated ones. The main would land on 216 Kleopatra and the other two would latch on to the moons, and the mission would teach us not only about asteroid composition but also contact binaries (two asteroids of similar size that end up sticking together, which is how 216 Kleopatra is surmised to have acquired such an odd shape) and the gravitational interaction found in a trinary system of this type. Personally I would love to see Canada send a probe to an asteroid like this (or even just a cheap flyby to snap pictures of a near-Earth asteroid as it approaches us), but there is little interest there in such endeavours.